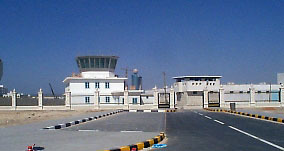 Some pictures of the old Sharjah Airport (as I promised, Mick). This took me a while to find, eventually found a book with an aerial photo, and took the bearings from there, looked out of the window and found I was standing above where the old runway was (now a road) and the tower was 200m away!!! 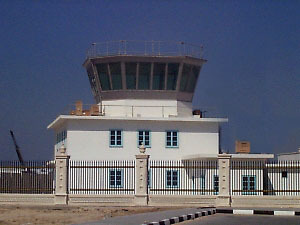 The tower was used as a pub for some time, before Sharjah became dry. 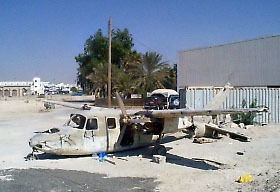 It was damaged by fire as well, and is now being restored to house an aviation museum. The fort next door will be part of the museum. Recent pics taken a couple of days ago appear below, and I'll scan the old aerial picture from the book later. Yeah I know...some of the pics below are missing. 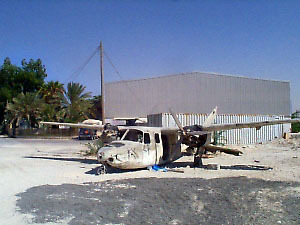 Old Aircraft with Hangar in the Background.